In a previous Magazine article, we covered tracking your time and tasks. In that article we mentioned some mind mapping tools. Now we’ll cover three mind mapping apps you can use in Fedora. You can use these tools to generate and manipulate maps that show your thoughts. Mind maps can help you to improve your creativity and effectiveness. You can use them for time management, to organize tasks, to overview complex contexts, to sort your ideas, and more. Labyrinth may not be intuitive at first. However, it is intended to be lightweight. It is also well-integrated with GNOME and runs smoothly. After you become familiar with the way it works, you’ll be able to create simple mind maps and save them like maps or images. Labyrinth is made with Python, GTK+, and Cairo so it works smoothly in GTK-based desktops like GNOME, MATE, and Cinnamon. It’s licensed under the GPLv2. 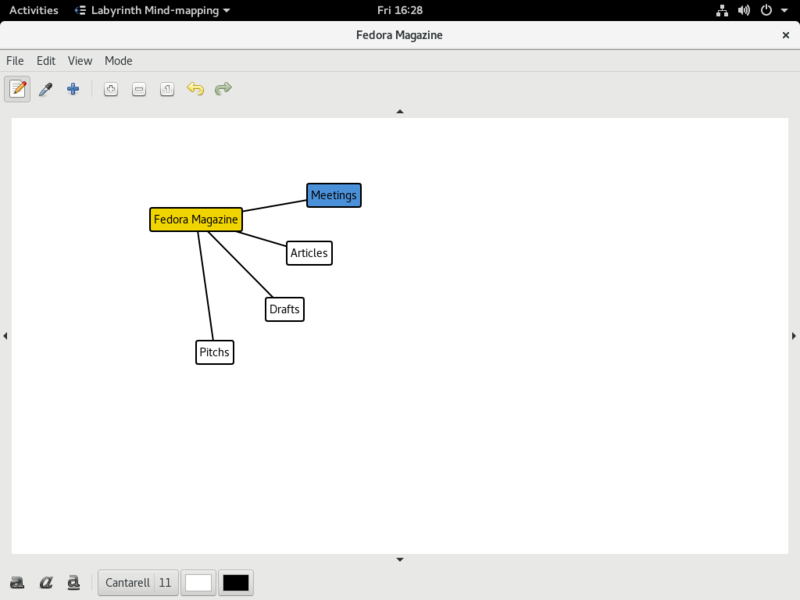 VYM is another useful mind mapping tool packaged in Fedora. It’s a mature application, with a lot of features included. It’s easy to use and intuitive. Furthermore, the export tool is pretty powerful, and allows you to export to numerous formats, including HTML or LibreOffice. The main screen shows the first map, so you can start work immediately. VYM has keyboard shortcuts that make your work easier. It also includes icons and signs to make your mind map more expressive. VYM is written in C++ and the Qt framework. It uses the GPL license, with an exception to port it to Microsoft Windows systems. The main screen allows you to work immediately. Like the other tools featured here, it’s easy, has keyboard shortcuts to speed your work, and exports to numerous formats. FreeMind is written in Java and licensed under the GPLv3. The tools you need to organize, plan, and get clarity on your thoughts are in Fedora. So what are you waiting for? Start mind mapping! Nice! Can you comment us how have been the improvements on the tools in the time? Freemind is an excellent rebuttal to those who those who insist that Java is slow. Freemind is a very nimble program, and being in Java is nice because it means that it’s easy to install and run on almost any platform. But more importantly, Freemind is USEFUL. It’s generously supplied with shortcut keys so that you can quickly build outlines and mindmaps without constantly being obliged to switch betwen mouse and keyboard. You can map as fast as you can type and you have a plethora of display options that help draw attention and to organize within a map. The other great thing about Freemind is that the mapfiles themselves are relatively straightforward XML files. Although there are a number of stock plugins to allow Freemind to import and to export using formats such as HTML web pages and Microsoft RTF, anything that you can convert to/from XML is fair game. No estoteric APIs or interfaces are required. I don’t really understand why you’d use a tool like this. I think I would need to see someone use it personally, or a step by step video on the benefits one is actually getting from taking the time to write it down like that digitally. Every time I try to pick something up like a wiki, or notepad or whatever I seems way more cumbersome to do it digitally versus a simple whiteboard that you don’t have to worry about formatting, buttons, shapes, etc, you just draw. Also, in the case of FreeMind and VYM, you can export your mind map to HTML and have web page with your map easy to upload in the www. I also use “Thebrain” software which is more like a relational database which present the information as mindmap plex. I use this for aplicationnotes, datasheets etc. But I am affraid this software is “payware” and requires a license although it comes in a “freeware” version with reduced functionality. It runs on Fedora and Windows using Java just as Freemind. If you think better with a whiteboard, you use this tool to rewrite your thoughts from the whiteboard. Then you can erase the whiteboard and start thinking out the next project. It is even handier if you have multiple projects being lined up over multiple years, and you have them initially thought out, then you can adding notes along the way. If you come back to the project in a year or two, you actually have your thought process written out along with supporting information. It is also very possible to use a regular spreadsheet to do much the same as the above. The only thing that I do not see with a spreadsheet is a loopback. I am evaluating Freemind, just to learn what it is that I can do with it. Thanks for the nice review of vym! Thanks so much to read and take time to comment! 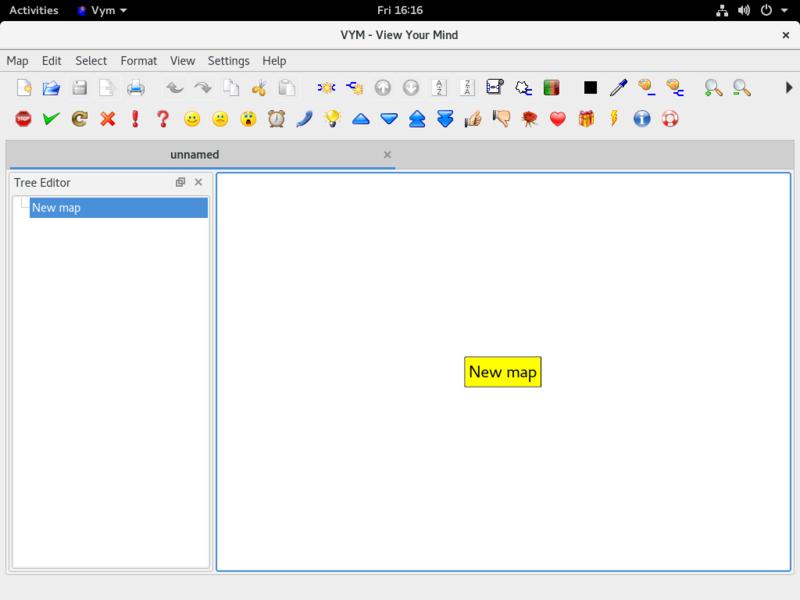 I’m not sure if you are interested, but I personally use Xmind software for mind mapping on Linux. It too is written in java – and the installation merely requires it to be unpacked and run. I can send some beautiful screenshots of a mind map from it – if you are interested in seeing more of it – or feel free to try it out – I personally believe that it’s abilities are amazing – though I don’t know how it will stack up against the others. It allows you to create organizational charts, (ie a center box with boxes all going down from it) and many more. It also allows you to add flags and icons to your elements on the page. It allows for font changes and bolding, underlining and italics. It also allows collapsing of the nodes you create, in addition to changing the colours and shapes of each node. Originally I was going to mention Xmind, but there are several things that stops me. First of all: “Open”. They claim is OpenSource, but the source available is for Version 3, then current version is 8, and that source code is not available. Other thing is that is almost prepared to work in apt-based distros, make it work in Fedora is not “Just unpacking”, even the installation script that is inside the zip file (not the deb file), has an “apt-get install” line. Other thing that stops me is that the export tool was cutted off the “free version”, when this is the core feature of these tools. I personally think is a great software, but they are taking people as fools with the licensing, and that’s why exclude it from the list. I’ve tried all these mind mapping, but for my project I’d rather use VUE (at moment).